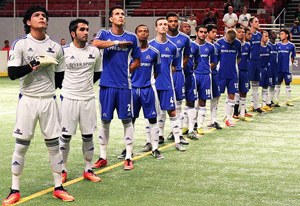 TULSA, OK—Cristian Mata scored three goals in an 8-5 Tulsa Revolution victory over Oxford City FC on Friday night in the Cox Business Center. It was arguably the best game in the short history of the Revolution franchise as Head Coach Dave Yates young team got started scoring goals early and often. The Revs were on the board less than a minute into the match as Sam Guernsey booted the home team’s first goal into the net. Mata added his first goal less than two minutes later, and by the seven minute mark of the first quarter the Revolution had roared out to a 3-nil advantage when Bryant Scrapper scored with Mata assisting. Some defensive lapses by the Revolution allowed three quick unanswered goals from Oxford City as Gonzalo Munoz, Alfie Robbens, and Lucas Totti knotted the score at 3-all by the end of the game’s first 15 minutes. In the second quarter, the scoring belonged to Tulsa when Michael Poneys scored a goal and Mata completed his hat trick with two goals in the frame. The home team held a 6-3 advantage heading into halftime. Oxford City netted another goal from Munoz to cut the Tulsa lead to two goals in the third quarter, and in the game’s final frame as ORU product Brian Beckford scored, and Scrapper would add his second of the match. Former Revolution player David Parente got the final goal of the match for Oxford City with less than 30 seconds left on the clock, but time would run out and the Revolution came away with the victory. It was the first game where the Revolution played a complete game from start to finish and they never trailed in the match. It was a great way for the team to shake off a disappointing showing in Wichita last weekend when the B-52’s handed the Revs a 12-6 loss. 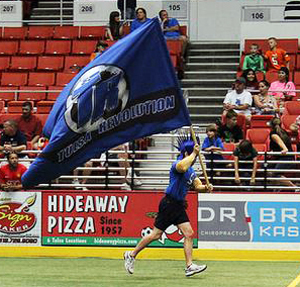 The Revolution currently stand at 1-1 in the MASL Central Division. The Revolution will be looking to make it two in a row next Saturday night as they host the Dallas Sidekicks at 7:05pm in the Cox Business Center. This entry was posted in Sports on November 15, 2014 by admin.